Alastair Machin, of Chaffinch Document, with John Capper. Former accountancy managing partner John Capper has set more than 20 small businesses on the road to success after branching out as a business and financial coach. John, from Cheddleton, is celebrating five years as head of John Capper & Co. after an earlier career which saw him lead 450 staff across 12 offices in RSM Bentley Jennison’s Audit, Tax and Advisory Services Division. “I branched out on my own in 2010 following the sale of RSM Bentley Jennison,” said John. “Business growth has always been a passion and I was fortunate to act as an advisor to many of my clients’ businesses in my years in accountancy. From house builders to web developers and accountants to quantity surveyors, John Capper & Co. has helped create jobs and growth across several business sectors. James Miller of Alton based Miller Commercial Brokers Ltd said: “John was the first person I turned to for support when I decided to set up my own business in 2013 and he’s been with us all the way. Young entrepreneur Alastair Machin has established two businesses in Stoke-on-Trent under his Chaffinch brand while working with John as an enterprise mentor. 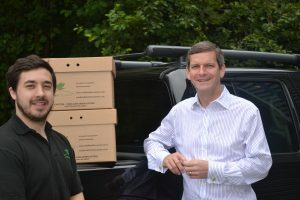 “I was looking for support from someone with a great depth of financial knowledge and experience of growth and John readily offered both,” said Alastair. Other local businesses to benefit from John’s experience include Cliffe Vale based Bee Active, building company RG Developments of Cheddleton and quantity surveyors, Stamp Associates, of Lichfield.